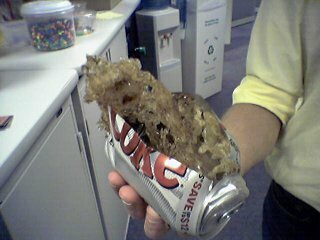 The can in the photo is the same orientation it was in the fridge: the soda has blossomed up and out of the can, then immediately frozen in place. The sudden drop in pressure as the contents burst out of the can must have frozen the soda nearly instantaneously. While reading about the relationship between pressure and temperature, I found the frightfully informational Phase diagram of water. It turns out ice can form in a number of different ways, depending on the pressure and temperature. I was amazed to see that there really is a substance called ice 9, just like in Vonnegut’s Cat’s Cradle, though I hope it doesn’t end up like his did (the whole world froze). I read a lot of that phase diagram.. they actually specifically mention Vonnegut in one part of it, and say that an ice which can form at ambient temperatures under normal pressure is ficticious. Damn cool book though.